Members can apply to be mentors or mentees, and while applying they enter information specific to their professional history, goals, and areas of expertise. Mentor profiles are posted on a members-only portion of the ASPHO website, and prospective mentees can browse their options and find a mentor to suit their needs. After 2 years of the program, the committee evaluated its success by sending surveys to existing mentors and mentees. The survey had a 76% return rate, and the reports indicate that both mentors and mentees feel a clear professional benefit from the program, have regular meetings, and plan to continue the relationship. Most reported their goals for mentorship involved career development and support with a research plan, though other goals such as job finding, exam prep, and networking were listed as well. Additionally, fellows who participated in this program reported having better luck in the job search following their fellowship programs. 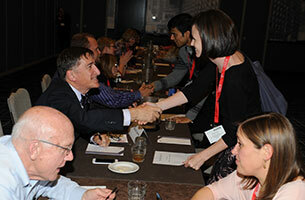 At ASPHO’s Annual Meeting, the mentorship program is expanded in the format of speed dating. Prior to the event, mentees sign up and include information about their goals and interests, and are matched up with three mentors for around 10 minutes each based on that information. During the event, mentees are able to receive guidance on the fly and get a taste of the mentorship program in a more informal setting. This event is hugely popular every year that it’s held, and has sold out each time. Additionally, mentees who sign up for this event tend to have increased involvement in other activities, boosting their involvement with ASPHO. As a clear benefit to participants across diverse personal and professional states, the mentorship program has enticed members to renew their membership to continue to benefit from participation. Testimonial evidence from participants shows that both mentors and mentees derive great value from the program both personally and professionally, and intend to continue their relationships beyond meeting their initial goals. This customized mentorship program drives member involvement with ASPHO, and provides a resource and enticing benefit to membership.